Last week I shared a few kids Valentine’s Day ideas but what about for the grown up person in your life? I know that some people would be pretty excited about getting those crazy straws, but sometimes you want to do something a little different then what you would do for the kids. 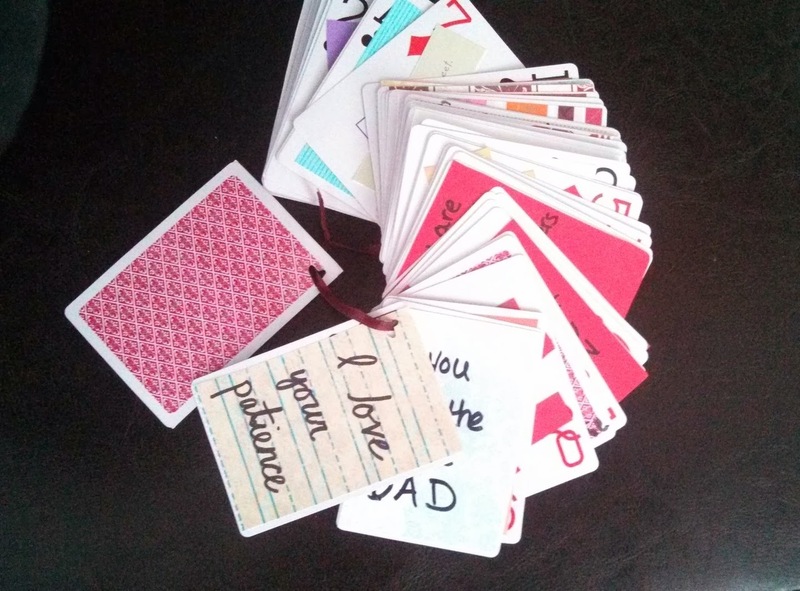 The first thing I am doing for my husband is a “Reasons I Love You” card set. 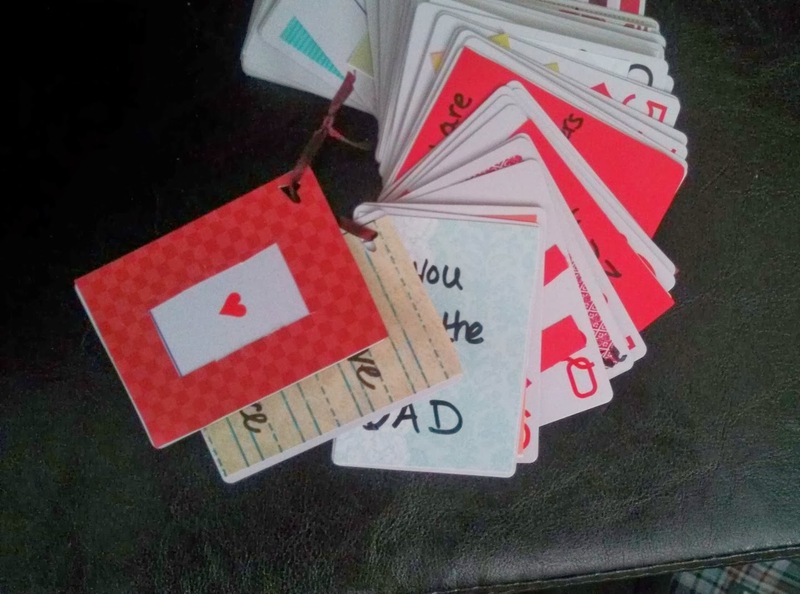 There’s a good chance you have seen them around, it’s a deck of cards with a reason you love someone written on each card. I didn’t follow any example I just made my own and there aren’t 52 reasons because some cards have quotes on them or other things. Here’s the basics of how I made it in case you are interested. I started with a deck of cards, they are 2 for $1 at Dollar Tree so you should be able to find a cheap deck at most dollar stores, or you might just have some around. A friend of mine used a partial deck that was missing cards, it’s fine because it doesn’t matter what cards you used. Here it’s blurry but the first thing I did was cut out scrapbook paper to cover some of the cards. You could easily just write with sharpie on all the cards but I felt like the words would be less cluttered with paper covering it. Some of them have hearts while overs cover the whole thing. 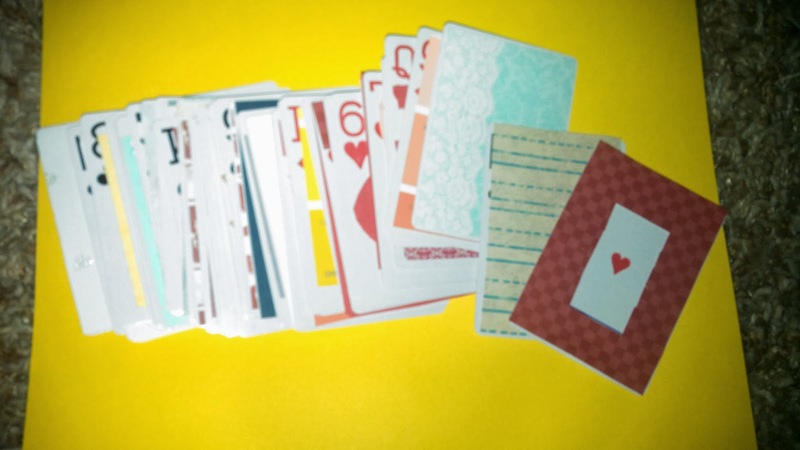 Have you saved the cards you got at your wedding? I have a whole box of them and lately I have been cutting them up and using them in our wedding scrapbook and I used some here. Some cute pictures or good advice I cut down and glued onto a card for this. Anyway, I covered most of the cards with paper and then punched holes in the corner of each card. I wasn’t exact with lining the holes up but once I strung them on the ribbon it didn’t mater. Then I just began writing on each card, because some of them had things from our wedding cards I didn’t have to write on each one. A few weren’t really reasons they were lines from our song or the inscription from inside his wedding ring. It didn’t turn out as cute as I wanted but I think he will appreciate it anyway. The other thing I plan to do for my husband is pretty simple. 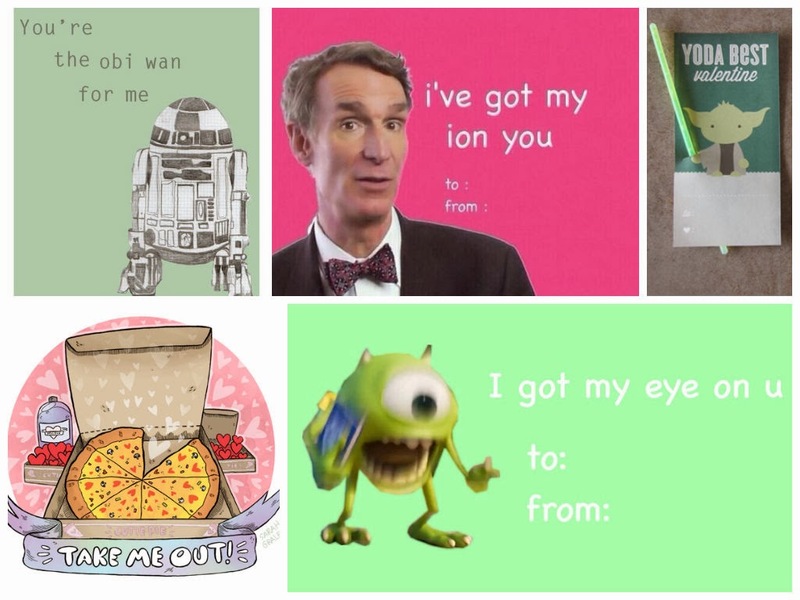 Around the internet I have found a bunch of cheesy cards. They are so random but I plan to print them and then leave them around for him to find. Some in his car, some with his lunch, I hope all day he will have a smile because of them. Here are a few I have found. I have more but some of them are inside jokes or based around tv shows that we watch. I know it’s all just silly stuff but that’s what I will be doing for Valentine’s this year. I want to know though, do you guys celebrate Valentine’s day very romantically or more just fun?